Step away from the ledge, Chiefs fans – Kansas City has won a game! The team picked up a road victory this Sunday against New Orleans in dramatic fashion, finishing the Saints off in overtime after an impressive comeback from a double-digit deficit. In the third quarter, it appeared that the Chiefs were on their way to an 0-3 start, as the team trailed the Saints by 18 points and had no answer for Drew Brees and the high-powered New Orleans offense. Matt Cassel had just thrown a terrible interception, and the Chiefs offense looked lost. However, the Kansas City coaching staff made a brilliant (and obvious) move to help get the team back in the game – it fed Jamaal Charles the ball. Charles ripped off a 91 yard touchdown run – the longest in team history – to help get the Chiefs back in the game. New Orleans moved the ball on the next drive, however Stanford Routt intercepted an underthrown Brees ball at the goal line. From there, the Chiefs defense finally looked like the unit it was expected to be this season. Brees never completed another pass, and the Saints offense never got another first down. The fourth quarter belonged to Kansas City, as Ryan Succop hit three field goals in the period and the team also got a safety on a sack from Justin Houston, who had a monster game for the Chiefs. Once overtime started, the Chiefs had all of the momentum, and after the defense once again held the Saints on New Orleans’ first possession, the team found itself with great field position. 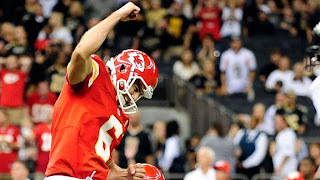 A few short passes and a gutsy fourth down conversion moved the team into field goal range, where Succop nailed his sixth kick of the day to give Kansas City the win. Winning this game was obviously huge, but it is the way Kansas City pulled this out that should have fans excited. The team relied on its playmaking running back to move the ball late and stopped asking Matt Cassel to throw the ball down the field, which should be the team’s game plan every week. The most encouraging sign was the play of the defense - the Chiefs absolutely shut down the Saints during the fourth quarter and overtime and looked like one of the best defenses in the NFL. Kansas City faces a tough schedule this season, but if its defense continues to play well, it should be in every game. This win should give the Chiefs some momentum and badly-needed confidence after the Kansas City media spent all of last week ripping the team. Up next for the Chiefs is a home game against the San Diego Chargers, who were beaten badly by the Atlanta Falcons yesterday. Kickoff at Arrowhead stadium is scheduled for 12:00 p.m.